Sunday Photo; Eunjin Mireuk – Wake Up and Laugh! 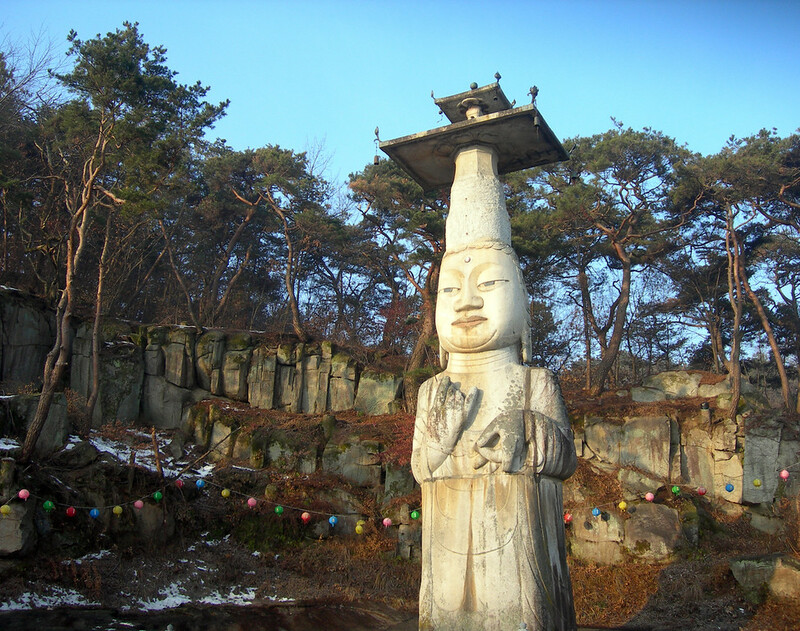 Carved over a 37 year span during the Goryeo period, this Future Buddha was 1000 years old when I first visited him at Gwanchoksa Temple, in 2006. He stands about 18 meters tall (half of which is from the neck up) and despite his awkward, slightly gawky appearance, there’s still something I find very beautiful about him. The top of his head is quite striking, and probably a bit of a hairshirt (even for a Buddha) if I had to guess. Imagine laying down to sleep with a partial pagoda sprouting from your skull, or trying to put on a t-shirt, or finding an umbrella with a long enough handle. 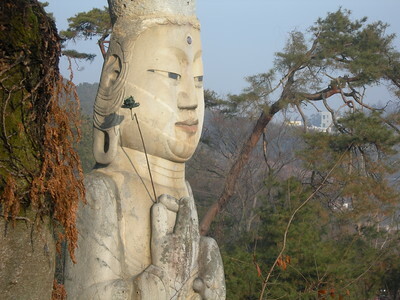 Seriously though – was there anything written at Gwanchonsa about the meaning of this Buddha’s head shape? Thanks for the picture Joseph! The Mireuk Buddha usually has a slab of stone or something balancing on his head, I really don’t know the significance. As far as this guys elongated hairdo… I haven’t come across anything explaining it, there probably was some reason though. anyway, significant is the oversizing of the heads here and there. did the artists – or their principal – wanted to show that the really important part of he body is the head – not to say what is in it -> ‘mind’? that what is in our heads is considered so important that it is shown in an oversized manner? another great picture, Joseph. thanks!! I hadn’t realized that the hat was indeed a pagoda. I’ve seen others where it looks more like just a device to keep the rain and snow off. To be honest, this Mireuk has always left me feeling a bit uneasy. Perhaps it is the proportions, but it seems a bit like something from a fever-dream. I love the idea about the importance of the parts of the body and think you are right… except…. Here’s something to try. Next time you see a friend, ask them to point to their mind. Don’t explain, just do it. Nine times out of ten, people who grew up in Europe or the US will point to their heads, while 9 times out of 10 people from Thailand or Korea etc will point to – their chests. I’ve carried out this experiment many many times and it always works like that. However, I still think you are right…. there is something in all art forms regarding the human figure that emphasises the face, that goes back to our very infancys I think. I remember reading an article once, I can’t remember where, on how if you took a Thai sitting Buddha image and used the same dimensions to make a standing figure, it would be impossible for the figure to support itself or walk! He wouldn’t need an umbrella! LOL! Love it! Thank you Joseph for this great picture and thank you Evelyn and everyone for such fascinating comments. It’s a cool representation of the bodhisattva, no matter what the imagery or proportions. I’m especially diggin’ the hands…. That’s wonderful – I couldn’t see the lotus in the other pic!